Who doesn’t love easy wins? Easy wins mean we’ve got energy left for the hard-to-wins and there is no easier win than the checklist. Many people’s initial reaction to checklists is that teaching is not a profession that you can get good at just by making sure you’ve ticked the right boxes. I agree. However you can make sure you’re not missing out something that is just messing with the possible synergy of your myriad of strategies. I’m not suggesting that just having an activity on the table when a class arrive is going to turn them into little darlings, but with each of the steps on the checklist below, you increase the likelihood of having a great lesson. It works for doctors, why not teachers? In Atul Gawande’s The Checklist Manifesto, he explains how he discovered that pretty clever, doctory people could utilise simple checklists before, during and after surgery and end up saving lives. Lots of them. He also explains a variety of other scenarios in which checklists can be useful, pointing out that we make two types of mistakes: ones that we make because we don’t know the right thing to do and mistakes we make even though we know what to do, but still make them. Checklists can help with both, helping less experienced teachers to include strategies they may have otherwise have left out and reminding those with more experience of the things that they know work, but have fallen off the agenda. 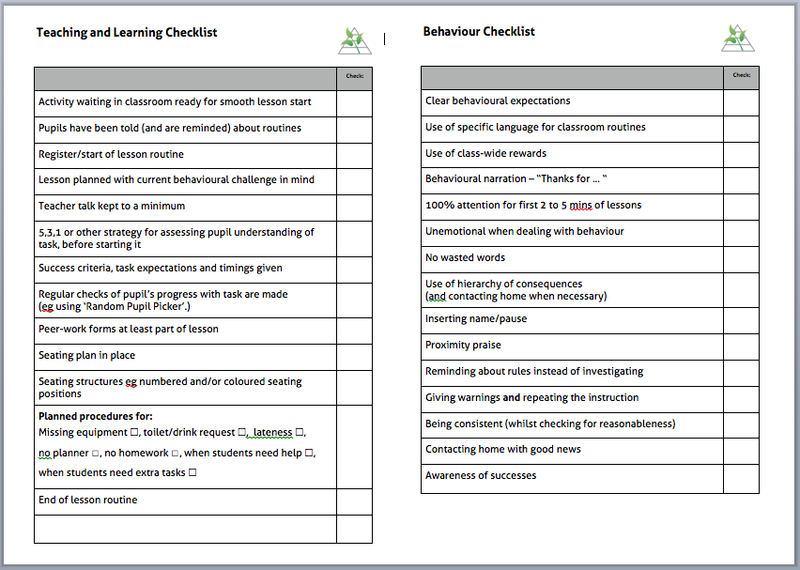 My teaching/learning and behaviour management checklists are just suggestions. You might get rid of stuff that is second nature and add some other checks you’ve been meaning to include in your teaching repertoire for a while. Either way, making the easy stuff easier makes the harder stuff easier too.